Coffee with Lisa Prysock and TWO Giveaways!! I am thrilled to have Lisa Prysock with us today! Thank you so much for joining us! PM: You have written stories in so many different genres, I hate to ask, but do you have a favorite, or at least one genre you lean more favorably to? LM: First, thank you so much, Paula, for hosting me for Coffee Questions. Favorite genre to write in? I lean toward historical romance, bouncing from the Victorian Gilded Age, to Regency, to the Scarlett O’Hara Era, to Mail Order Bride and the Pioneer Era. However, once I finally tried to write contemporary, I fell in love with it also, and then there’s the whole world of Royal Romance and the stuff fairy tales are made of. I can’t seem to pick just one. I am completely smitten with them all. If I can dream it, I can write it. PM: When do you find the time to write? Where is your favorite place to write? LM: Since my children graduated from homeschool (I homeschooled the youngest two for six years), I write as a full time career. My favorite place to write in the winter is the dining room table near the fireplace, bookcases, our piano, and a hutch with a few of my favorite dishes. However, I usually write in my writing office. It doubles as a craft/sewing room. Hubby installed a ginormous L-shaped desk for me and it faces a wooded area across the street. The view is serene and inspires my writing. PM: From your bio, I see you have lived in several different area’s of the US and Kentucky is your home, what do you love most about living in Kentucky? LM: I love the lay of the land and the rich history here. I am also in love with the people here. Many of them have a kind of southern charm and friendliness, along with a love for God and country. LM: Can I be a princess and help make the world a better place? My kingdom will be a place of love and kindness where evil isn’t allowed to exist. LM: Yogurt, Golden Delicious apples, leftover spaghetti, green beans, coffee creamer, water, spinach dip, and salad. Did I mention coffee creamer? Heh, heh. Lots of coffee creamer. 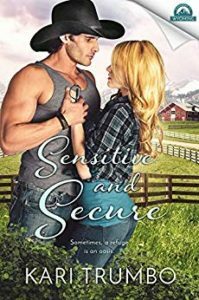 LM: I’m honored to be in a multi-author series “Whispers in Wyoming” with Kari Trumbo, and am reading her book, Sensitive and Secure. It’s about a stalker, LOL. LM: Definitely some of both. I research a ton of stuff, but I also draw upon my own experiences. LM: Lucy Maude Montgomery, Jane Austen, Laura Ingalls Wilder, Louisa May Alcott, Margaret Mitchell, and Jesus have been my main influences. LM: I like swimming, taking a walk, going to visit and tour historical houses, cross stitching, crochet, drawing, gardening, dancing around the house while I’m cooking or cleaning to Christian contemporary artists, going out to dinner with my family, and watching a really great Hallmark or family oriented movie, but my guilty pleasure is watching a really awesome PBS series with my husband like “Downton Abbey,” “Pride & Prejudice,” “Poldark,” or anything I can find that’s completely old-fashioned. LM: Coffee, with cream, no sugar. Tea in the afternoons, with sugar, and sometimes honey. Lisa is being SUPER generous and offering not one, but TWO ebook giveaways! Please comment on this post and tell us what YOU would name Harry & Megan’s Royal baby if they asked you! 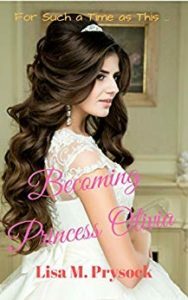 Suggest both a boy and girl name and you will be entered to win either Becoming Princess Olivia OR Victoria by Lisa Prysock! Contest will run for one week from today and winners will be notified via email! Each of her books have a theme such as suffering, the depths of God’s love for us, mercy, overcoming, discovering purpose, and more. Many of her books have fun, interesting characters and they often shine a spotlight on influential evangelicals in history such as Booth, Chapman, Moody, Charles Wesley, Spurgeon, Fanny Crosby, and more. She is also the author of a devotional. Lisa remembers writing her very first book in kindergarten in Wisconsin, with help from the teacher. “It was a book about ‘Curious George.’ I couldn’t spell yet, but the teacher wrote words beneath my illustrations for what I wanted to say on each page and stapled the pages together for me.” She has been writing ever since. She won a prize for a short chapter story in 8th grade and remembers buying a manual typewriter with some of her first earnings. 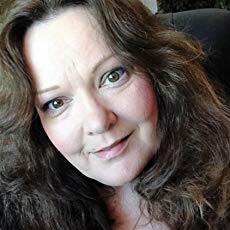 Some of her interests include walking, swimming, working out, cross stitch, sewing, crochet, sketching and painting, dollhouses, gardening, shopping and fashion, cooking and baking, hanging out with her family, watching movies, and reading/writing great books. She likes chocolate, dancing, learning to play the piano and violin (“a painful process,” she admits), coffee, tea, flip flops, hats, butterflies, hydrangeas, roses, petunias, dill pickle flavored chips, and driving around in her red Jeep with the sunroof open, blasting the volume and singing to the Lord. Some of her favorite music artists include Jordan Feliz, Tedashii, Hollyn, Lecrae, Toby Mac, Michael W. Smith, and For King & Country. 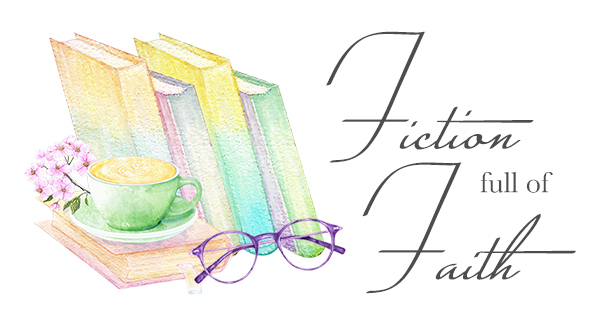 Previous Coffee with Elaine Stock ~*PLUS*~ a paperback Giveaway! Next Coffee with Marion Ueckermann Discussing Remember Me & HUGE Giveaway! I would name the baby Emory Evan, whether a boy or girl. What an excellent suggestion, Karen! Thank you for sharing! Great name suggestion, Karen. Thank you for commenting. Jessica if it’s a girl, Jeremy if it’s a boy. Aww, those are sweet names, Kim! Appreciate you visiting with us today! If I could name Harry and Megan’s baby, I would name the girl Diana after his mother. I’d name a boy Jerome, just cause I like it! Thank you, Trudy! I would have to agree about the girl name, sigh…..Lady Di was amazing! Thanks for stopping by, Trudy! Love your name suggestions, especially Diana. What lovely historical references for names! Great ideas, Mary! Thank you for sharing. Absolutely love these name ideas. Very appropriate for a royal baby. Nice suggestion, Lisa! I really like those too! Excellent name suggestions! Aunt Katherine would be honored. 😊 Thanks, Lisa! I would pick Henry for s boy and Diana for a girl. Great giveaway! Thank you! Very fitting names, Dorothy! I can’t help but sentimental about the name Diana! I started reading early also. Have not stopped. Wow so many wonderful genres you write. This is wonderful. I would be a princess also, and help people see that kindness and compassion are wanted, needed and rewarmed. Aww, that is so sweet, Lori, I love those names! And who doesn’t wish they were a princess at least once in a while?? Thank you so much for sharing with us today! Sweet names, Julie! Thank you for sharing with us today! I would name the girl Victoria Annalise and the boy Christopher Patrick. It sounds like you and I have a lot of the same taste in books and music! Lovely name suggestions, Candace! Thank you for sharing! For a girl, I think Harry and Meghan should pick, Diana. Personally, it’s not one of my favorite names, but I think one of their children should be called that, just because of the amazing person, their mother was.